Dover District Council (DDC) has removed 3 well-used cycle racks in Sandwich in an exercise with the town council to "remove street clutter". SPOKES says they are "badly needed", and supports moves by two local cyclists to reinstate the racks in this central position. Linda Keen from nearby Aylesham (also a member of Dover District Council) criticises council officials for not consulting cyclists before acting, Linda added, "Visiting cyclists like me head for the centre of the shopping area – for refreshments and shopping - which is why the three you have removed were well used, and the ones in the empty wilderness of the Guildhall car park are not - I certainly don’t even know where they are. Car parks are for cars, not cyclists. Linda told DDC their offer to display a map of alternative cycle parking would not work. "As a regular cyclist to Sandwich - the reason the other cycle racks are apparently not used is that they are in the wrong place." Cyclists will park here anyway! "You should be aware that cyclists will continue to park their bikes in the area – with or without your cycle racks – simply because it is conveniently close to the main shopping square and streets, and more secure for the bikes than a distant car-park. The whole point of cycling is that you can get straight to the middle of a town and not be marooned on the outskirts. Cycles will continue to be tied untidily to whatever street furniture is around in this area, and will be much worse visually than simply re-instating the racks." Linda stressed she's not against improvements for pedestrians: "Great to improve the general area – really nice place for an excellent coffee from wonderful No Name - but pedestrians would not have tried to walk where the racks were so neatly tucked away next to the rubbish bins; they were not in anyone’s way at all." 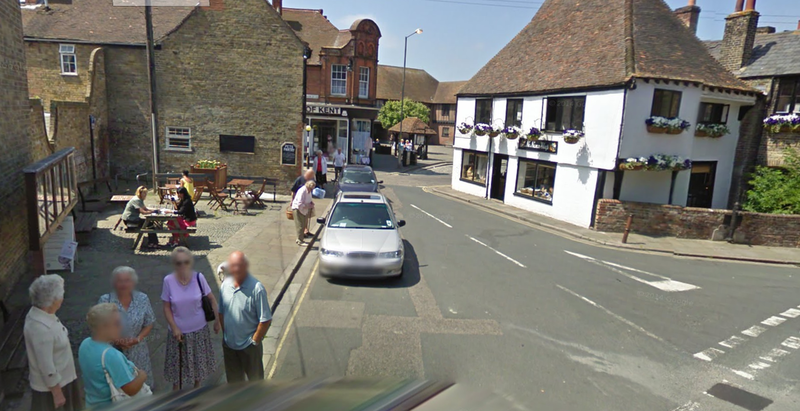 "Cycle facilities in short supply"
SPOKES member, keen cyclist Paul Carter added,"On further investigation the public land that is right in the centre of Sandwich is opposite a cafe that uses the area for alfresco tables, ironically for visiting cyclists. In order to get more tables in DDC have removed the cycle racks, and are not replacing them. There is cycle parking at the Guildhall a couple of hundred metres away away but why take cycle facilities out when they are in short supply. Why should cyclists have less facilities but coffee drinkers more? ​SPOKES supports this design of cycle rack, known as "Sheffield stands" (an approved KCC design) because they give a strong fixing point for locking up bikes, with good support. Location is also important: whether tourists or locals, cyclists feel happier if their bike and any attachments are in public view - ideally near where they are sitting. 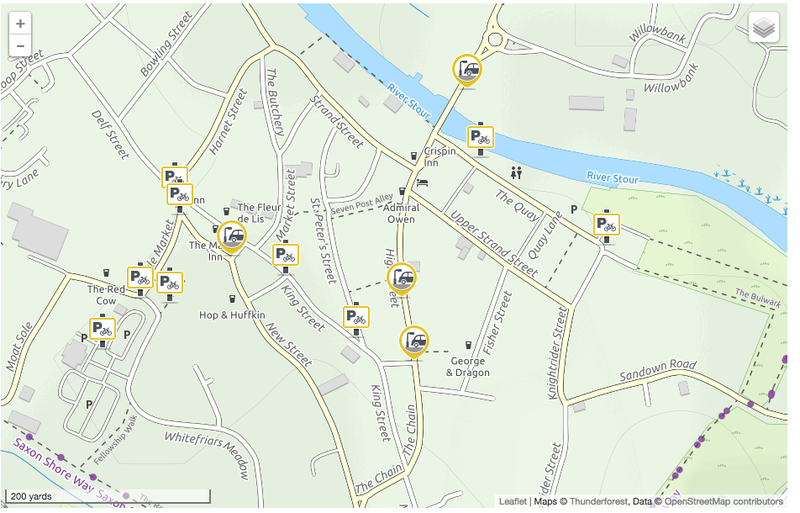 Map from CycleStreets with acknowledgements, Click to connect with live interactive map, including photos and details of cycle parking. Do you support the call to put back these cycle racks? I often cycle into Sandwich, and in the summer more secure cycle parking is needed not less. Sandwich should stand up to DDC and have them reinstated. Dover is a dump that people avoid. Sandwich is loved.. Please reinstate the bike racks in No Name Street. We have and attract a lot of cyclists and the number seems to be increasing. It does seem more than a wee bit mad to take them away considering how horrid the traffic thundering through those little streets in sandwich makes the town feel - surely they should do more to try to get people to cycle around there, not less. As the owner of one of the towns bicycle shops we are very surprised at the views of Dover District Council and that the rack was considered "street clutter". In a time where cycling is being encouraged to combat both pollution and unhealthy living practises. I find it ridiculous that the council would take measures to discourage cyclists from entering the town. The previous racks were very popular as cyclists used the No Name Shop as a regular meeting/rest stop during rides. Many local residents used the racks while supporting many of the smaller businesses in the town centre. These businesses need the support of these residents to survive. This is yet another decision by Dover District Council to marginalise the small local businesses through their thoughtlessness. Its also a shame that town council and town team did not see fit to consult those who would be most affected i.e. small businesses and local residents however this is not unusual. No. There are 8 cycle rack bays in the centre of Sandwich , all under used, one only 30m away from No Name, the other 60m. The remaining racks are all within a 5 minutes walk. What a shame. The cafe in No Name street is a great rendezvous place for cyclists, and a reward for those cycling into the town from a distance. Seems like just the measure not to take if you want to attract people to the town. Short sighted and silly. Use these a lot - really convenient for shopping - please put them back - local Cllrs are too concerned about gentrifying Sandwich at the expense of local residents - cyclists and pedestrians have always mixed well here. Seems a little crazy to take away some of the provision for parking bikes in the centre of sandwich when cars thundering the little streets there is a massive problem! Why remove existing infrastructure that encourages cyclists to visit the middle of Sandwich? (from Cllr Paul Carter) - I brought this to the attention of spokes being a keen cyclist myself and with Cllr Keen we are both shocked that Dover District council can remove cycle parking at a time when other Councils are putting new cycle parking in! Also due to the new traffic measures DDC are putting in the town and the rise in parking rates there will be more cyclists in Sandwich not less! This is a typical non cyclist oversight and should be rectified immediately. I was at a shop on this very junction on Saturday and counted 15 cyclists who had come into town looking for somewhere to park up. If Dover want cycles chained to road signs and lamp posts they are going about it in the right way!